We’ve talked (okay, bragged) about it. We’ve published highlights. We ate all of Aldi to do this. That’s right, you have come to the World’s Most Comprehensive Guide to Aldi Products: Dairy. Alright team, it’s time for the dairy review. We don’t mean to be cheesy, but we love dairy so much it yogurts. Great opportunity to switch to save! Our testers found that the only difference in the products was in the texture, Chobani was a touch thicker. Our testers noticed a slight difference in taste, but had difficulty pinpointing the difference. All of our testers agreed that they would switch to save! The only noticeable difference between the cheeses was the name brand was softer. Switch to save! There is a visible difference in the texture, the generic being smoother. While the taste was spot on. Reggano's Parmesan Cheese is spot on with Kraft. All testers said they would switch to Reggano brand. Kraft's is fluffier while Reggano is slightly more dry. Switch to save! Our testers noted that the name brand was slightly more cheddary and the store brand had a more buttery taste and smell. The closest cheese match we've seen so far! Definitely switch to save! The only noticeable difference between the name brand and generic was the softness of the name brand. Sargento does not separate the individual slices with paper, making some slices difficult to separate. The name brand had a slightly stronger smell, while the store brand had a stronger buttery smell and taste. Our testers recommended switching to save. This is a great cheese dupe! Our testers would switch to save! One tester found that the name brand was much softer. Another tester experienced a very buttery taste and smell from the generic. Sargento has a mild flavor and a smoother, softer texture. Happy Farms does not individually wrap their American cheese slices, our testers immediately missed the ease of packaging. The texture was also off when comparing to the original, Happy Farms had a rubbery texture. Although the generic slices were a little thicker and lacked a little spice, our panel would switch to save! The name brand has a slightly sharper smell and taste, while the generic has a smoother texture. Our testers recommended sticking with the original. The store brand lacks the cheesy smell and taste provided by the name brand. The name brand has a more natural pepper taste, but our testers would switch to save! The majority of our testers would stick with the name brand. The store brand has a slightly more sour taste. Sargento has a softer texture, which appealed to some of our testers. Taste wise, these are very similar. The Happy Farms cheese has a smoother consistency, similar to Velveeta, that was not expected by our testers. 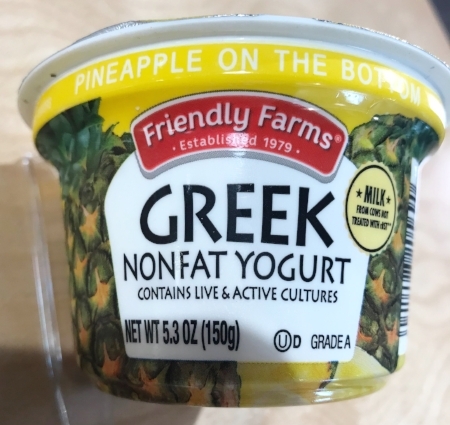 Depending on your yogurt preferences, you might prefer the sweeter taste of the name brand or the slightly sour taste of the generic. Three out of four testers preferred the Kraft cheese. Kraft was sharper, and Aldi was slightly more rubbery. One tester preffered the Aldi Cheese. Our testers found that the generic had an earthier cherry flavor that was not as appealing as the Chobani cherry taste. The generic also had a chalkier texture that our panel found worth noting. The name brand was much closer to what we expected for mild cheddar. Stick with the original!